A technology that is being forgotten about when it comes to home and small-business networking is Power-Over-Ethernet. This is where a Category-5 twisted-pair Ethernet cable is used to supply power to a device as well as sending the data to it according to the Ethernet standards. Typically this technology is used in larger businesses for providing power to devices that are to be installed in difficult places and/or where a reliable centrally-managed power supply is desired for these devices. Examples of these include IP-based video-surveillance cameras, wireless access points as well as VoIP desk telephones. There are a few cabling technologies that are analogous to Power-Over-Ethernet in the form of most USB setups, TV aerial systems that implement a masthead amplifier, the traditional desk telephone that is powered from the exchange as well as microphones that implement “phantom power”. But this technology can be considered relevant to home users and small businesses such as with wireless access points, VoIP telephones or small-time consumer AV applications. The two main standards are the IEEE802.3af PoE standard which was ratified in 2003 and the IEEE802.3af PoE Plus standard which was ratified in 2009 and used for higher-power applications. The former standard yields 48 volts 350mA of DC power providing 15.4 watts of useable power whereas the latter standard yields 57V 600mA of DC power providing 25.5W of useable power. There have been other proprietary standards for this application including some “passive” setups that pass 12V or 5V along a pair of wires in the Ethernet cable to a splitter. But these only work with matching equipment and it is better to stick with the industry standards for this application i.e. 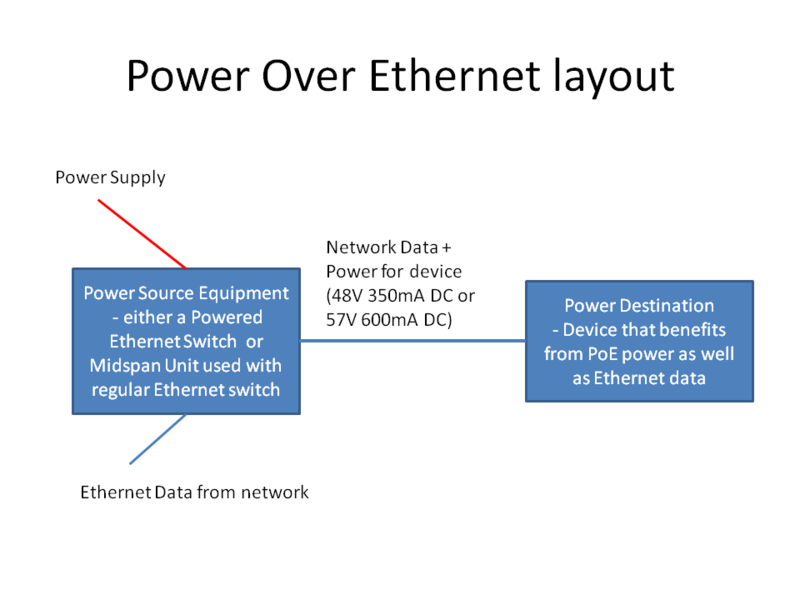 802.3af Power Over Ethernet and 802.3at Power Over Ethernet Plus. There are two key device roles: Power Sourcing Equipment which is what provides the power, and Powered Device which is what benefits from the power. This device can be a function of an Ethernet-capable network device like a switch, router or HomePlug AV bridge. Here, this simplifies the installation by having one box perform both these functions and, in the case of an Ethernet switch, such switches may be described as being “powered switches” or having Power-Over-Ethernet. 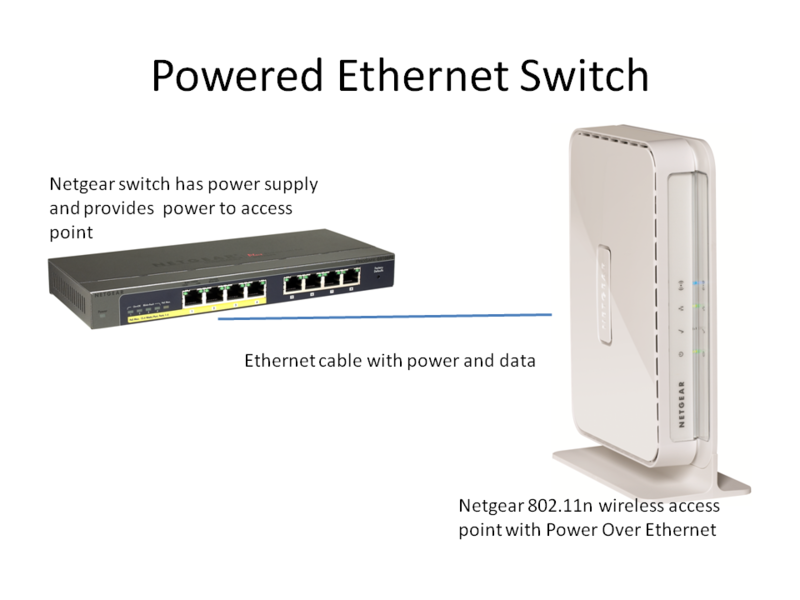 Some of the cheaper small-business switches that have this feature may have the Power-Over-Ethernet power available to some of the ports rather than all of them. 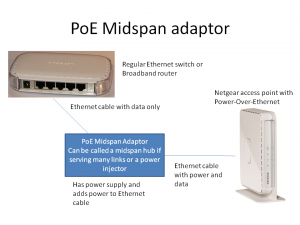 On the other hand, there are “midspan” power hubs which go between a regular Ethernet switch and the device that is to be powered using Power-Over-Ethernet. 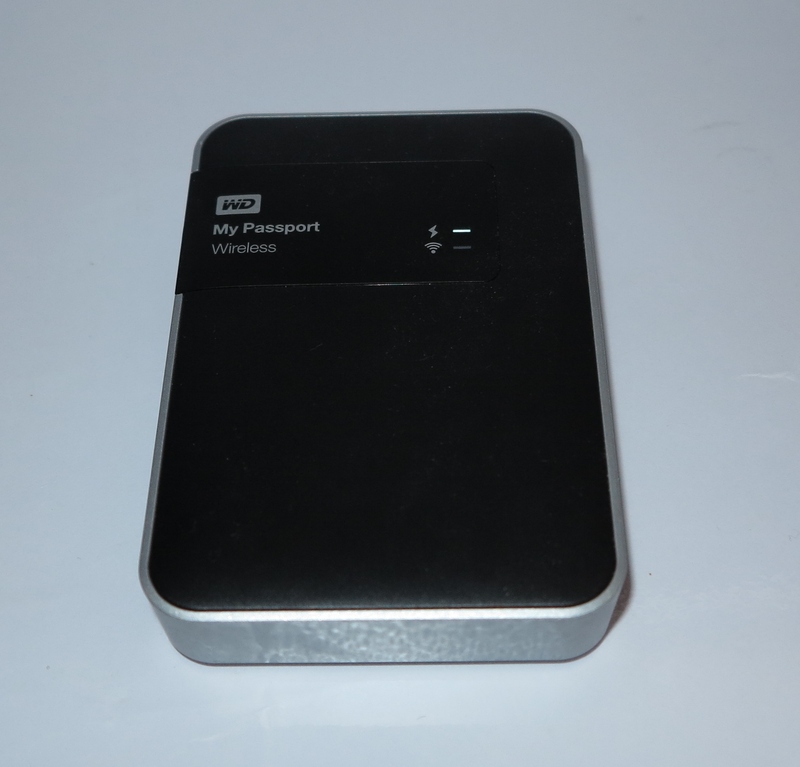 Such devices may be known as “midspan adaptors” or “power injectors” with the latter name used more for a “wall-wart” or “power-brick” device that provides power to one device. These devices only supply the power when a Power-Over-Ethernet device conforming to the standard is connected to them. 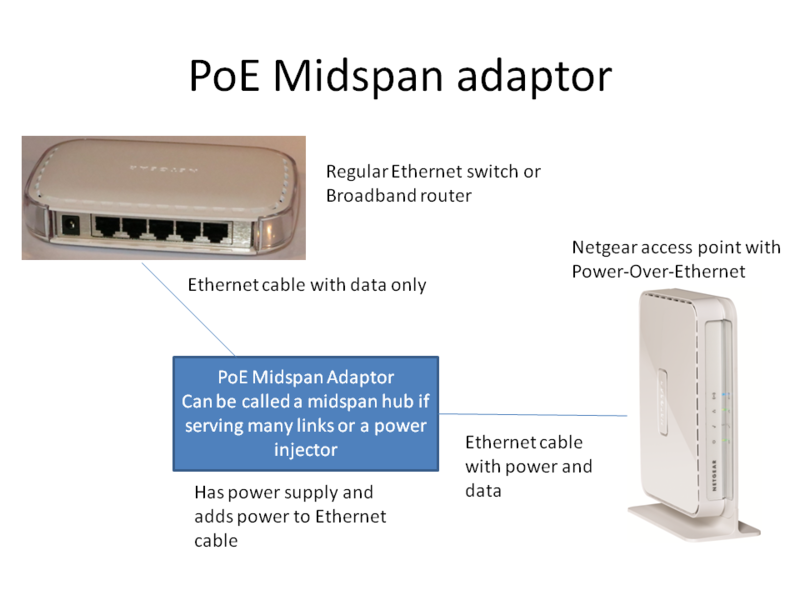 In the case of 802.3at Power-Sourcing-Equipment devices, they would also be able to provide the “juice” to the 802.3af-compliant PoE Powered Devices. 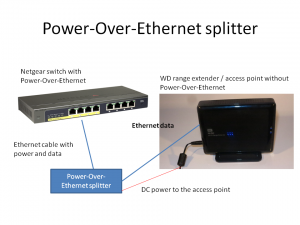 This would typically describe the devices that benefit from the power provided by the Power-Sourcing-Equipment devices, whether it be an Ethernet switch with Power-Over-Ethernet or a midspan device like a “wall-wart” power injector. This can range from the devices that make use of the network such as the IP camera to network infrastructure devices like the access points or Ethernet switches. For that matter, most well-bred VoIP office telephones with Power Over Ethernet have an integrated two-port switch so a user can plug a desktop computer in to the phone to link it to the network. But there are also the “Active Power Splitters”, sometimes known as Power Splitters or PoE Power Adaptors. These connect to an Ethernet connection that has Power-Over-Ethernet and “tap” this power to provide power to a device that can’t be powered using Power-Over-Ethernet. They pass through the Ethernet data while providing the power to the device at a known voltage, typically 12 volts or 5 volts DC using the typical DC connector that most computer and network devices have. They may have the voltage fixed by the manufacturer, typically to serve the manufacturer’s devices or the so-called “universal” devices may allow the customer to determine the voltage. Similarly, some Ethernet switches that are powered using this technique may have a “Power-Forward” feature where they can pass through power from the Power-Sourcing-Equipment to one or two of the ports while using the PoE power for their own switching function. 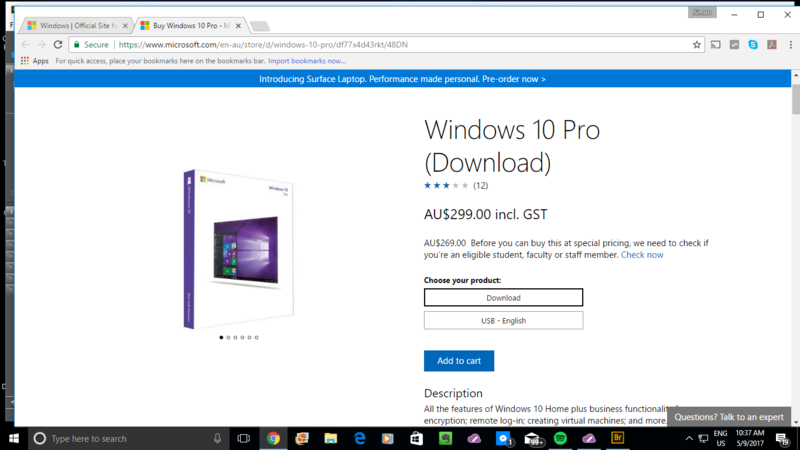 Why is this standard of value? The fact that the Ethernet cable is used for supplying the power to the network device means that you don’t need to have a power outlet near that device. 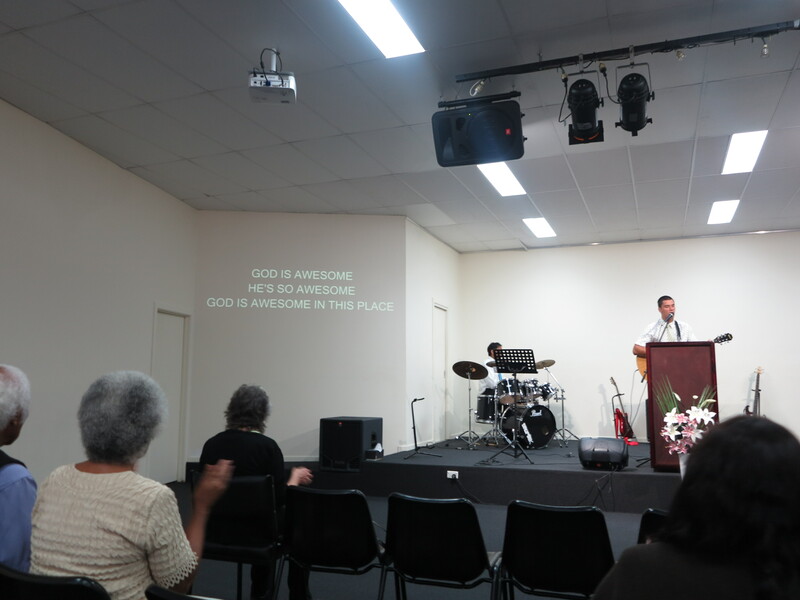 This leads to flexible installation arrangements such as having the device in the ceiling or high up on the wall. As well, you don’t need to hire an electrician who is skilled in mains-voltage wiring to install that outlet. Another benefit is that you don’t have the risk of a device like an access point or IP camera being accidentally disconnected by someone who wants to plug in a phone charger or, more commonly, cleaning or maintenance staff disconnecting the device so they can run that vacuum cleaner or power drill. It also has benefits for outdoor installations where you don’t have to install a weatherproof power outlet near the device. It could then allow for you to install a power injector indoors, usually close to the “network hub”, then just run the Ethernet cable to the access point or IP camera. For small installations that are on a budget, the money saved on a weatherproof power outlet could go towards you preferring the device that is in a housing appropriate for the job i.e. a weatherproof housing. It also allows for the power supply to the network devices to come from a central source where there is a single point of control. This can allow for situations like the central power source to have an uninterruptable power supply this allowing the network devices, especially VoIP telephones and IP cameras, to function through power outages. Similarly, a Power Sourcing Equipment device could be managed from the network thus allowing for remote control of a PoE device’s power. This could avoid things like car trips to the office to turn a balky access point off then on in an attempt to reset that device. Similarly, it may be feasible to have some devices turned off when the building is empty for security or energy-conservation purposes. The Power-Over-Ethernet technology also allows for one Ethernet cable as a data-bearing and power-supplying cable between the Power Sourcing Equipment and the Powered Device. This is a real boon when it comes to installing the device because you don’t have to factor in another cable to allow that device to work as intended. This cuts down on the installation time especially where time is money; as well as allowing one cord to be shoehorned in to place providing for an aesthetically-pleasing installation. In the case of the VoIP desk telephone, the absence of a power cord to that device makes the installation similar to a traditional desk telephone and you don’t add extra cables to the Spaghetti Junction of cables that exists under most desks. When we see devices like the Asoka PlugLink PL-9660PoE “homeplug” which is also a Power-Over-Ethernet power source, it shows that this technology is increasingly becoming more relevant to the home network. 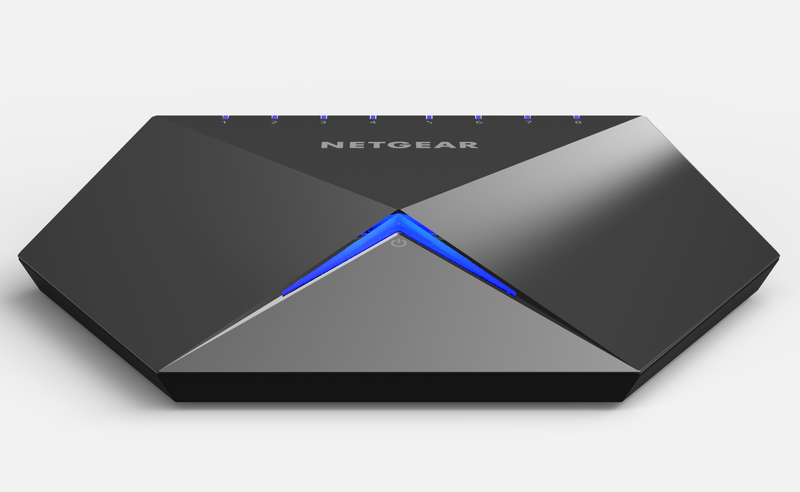 If you subscribe to an Internet service that implements a separate modem like most cable-modem services, you will end up having to connect the separate modem to your broadband router via an Ethernet connection. The Power-Over-Ethernet technology can work well here by alleviating the need to provide separate power to that modem, which means one wall-wart less to deal with and a cable less to add to the rat’s nest. This can similarly apply to setups where you have a wired modem router and a Wi-Fi access point or even those setups where you implement a wired broadband router that is linked to a modem and an access point. 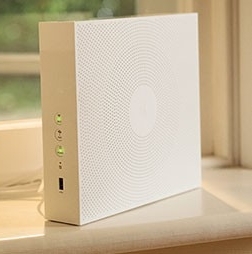 Not all homes can be covered easily by the access point integrated in a wireless router and a preferred method of extending coverage for the Wi-Fi segment in these locations is to implement an extra access point connected to a wired LAN backbone. 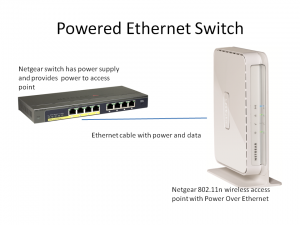 The Power-Over-Ethernet technology can provide for various improvements in how these access points are set up because of the need for only one cable to that access point. 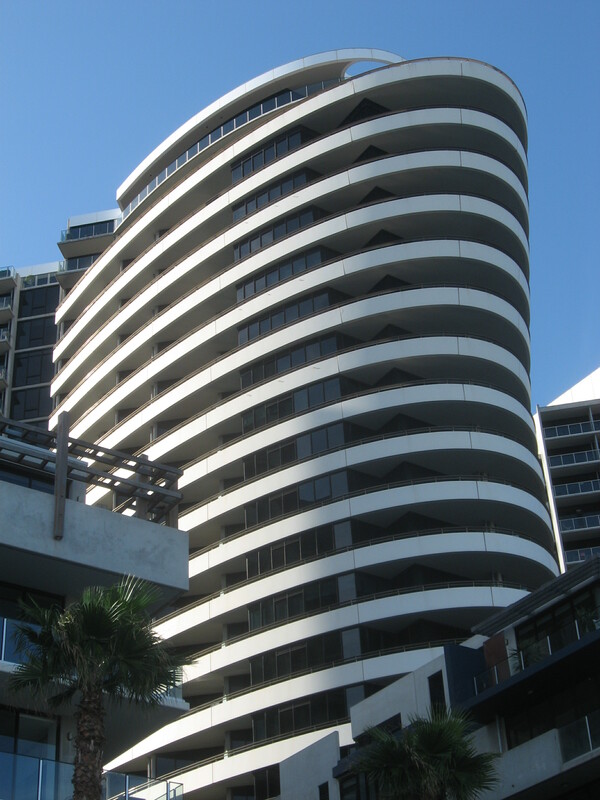 This would lead to an aesthetically-pleasing installation that can provide optimum performance for that area. For example, you could place the access point on top of the credenza or dresser or even on that pelmet above the window yet have the cable tucked away neatly yet the Google Nexus 7 tablet shows a strong Wi-Fi signal when used in the area. To the same extent, wireless-client-bridge devices can also benefit from this same technology if the network device that they are connected to supports it. 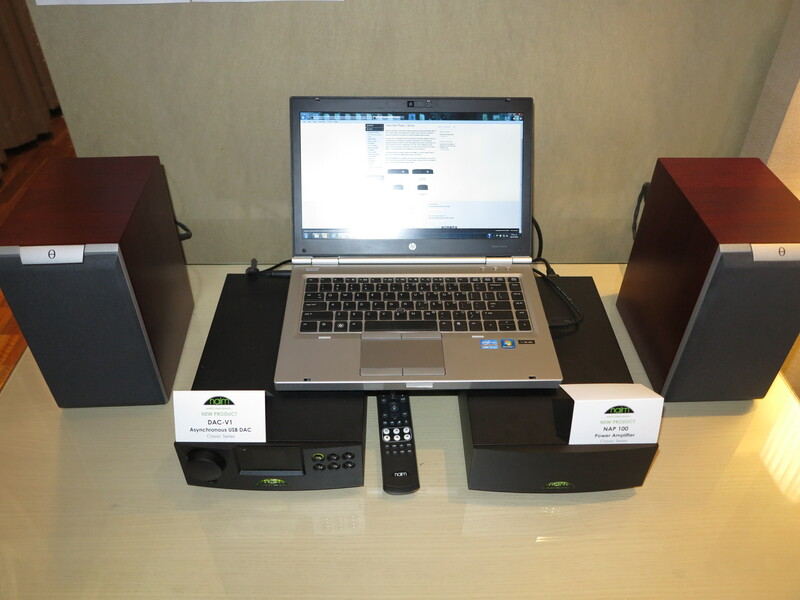 For example, a home-theatre receiver that has network capability via the Ethernet port for DLNA media, the “new shortwave” (Internet radio) or Spotify could power an nVoy-compliant wireless-client-bridge that links it to a Wi-Fi segment. Here this device is configured using the receiver’s control surface or remote control but you only have one cable to that wireless-client bridge which sits on top of the wall unit that the receiver is installed in. To the same extent, a tablet, small notebook or “adaptive all-in-one” computer could benefit from a “clothespeg-style” Ethernet connection not just for reliable network connectivity but as an alternative external-power connection. Here, you could avoid compromising battery runtime while you have these computers plugged in to the Ethernet socket. 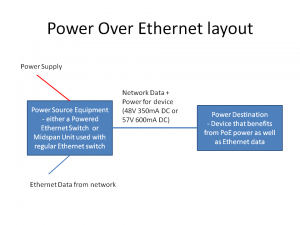 This article highlights what the Power-Over-Ethernet technology based on the IEEE 802.3af and 802.3at standards is all about and the fact that it isn’t just relevant to big business. This technology, like most communications and computing technologies is one of many that trickle down from the big end of town to the small office and to the home.